I’m not sure what was happening a few months ago, maybe it was the super frigid winter or Valentine’s Day or maybe just something in the water, but all of a sudden it’s time for lots of sweet babies to start coming! Without thinking about it I can count 8 friends who are about to have new babies – what a fun time! With all the baby showers to plan I thought it would be a good idea to make a list of what needs to be done, in the smartest order, so I can think clearly about each shower while I’m planning it. Theme: Besides the date, I’d say the first step would be to decide on a theme. Is your friend having a boy or a girl? Will it be a co-ed shower or just ladies who are invited? Does the mom have a specific nursery theme that you’d like to use? I like to keep it simple. This first shower I’m going to throw is for a baby girl. We are going to use white and light pink as the theme. Invitations: Now that you have the theme, how are you going to invite people? Typically people receive invitations in the mail, which is nice as they can be put in the baby book, and they set the tone of the shower. 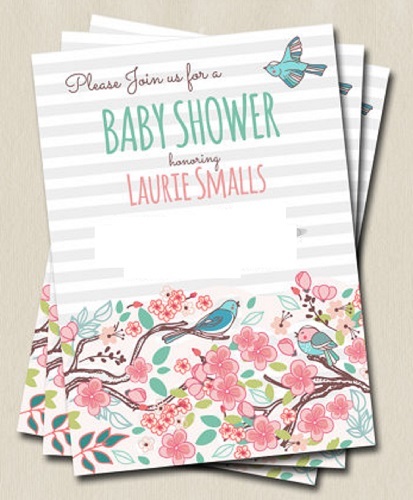 Etsy has some really fun shower invitations. Don’t you just love these? Decorations: Look to the invitations for inspiration for the decorations. Use the colors, and the design. For this shower, with the sweet invitations above, we will stick with white and pink, add a little gray here and there and throw in some flowers as the main decorations. *Hint* SimuLinen has high-end disposable napkins, table cloths and table runners – they are AMAZING! They’re relatively inexpensive and make cleanup such a breeze! These are so much more economical and absorbent than cloth napkins. 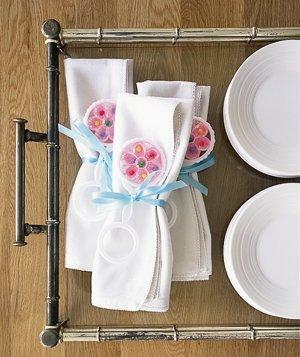 Add a flower or baby rattle and make the napkins part of the decor. White disposable napkins are great, just tie a ribbon around and/or add a flower, or rattle and they are perfect! Food: Keep it simple. Time of day will help determine the food, but personally, I love a shower at brunch time: muffins, mini quiches, banana bread, fruit and cupcakes or a cake make a lovely brunch, and they are all relatively easy to make. I’ve also been to a shower with an oatmeal bar – oatmeal, brown sugar, milk, granola, craisins, etc. I think it was my favorite part of brunch! Add a yummy juice concoction (OJ and cranberry juice is a delish!) and some coffee and you’re done! Schedule: Generally speaking, showers should last about 2 hours. If the invitation says the party starts at 10, then at 10:05 you should get people to start eating, this way it’s not obvious when guests who are a little late slip in. Games should come right after the food and then the gifts. If the shower runs long, people can slip out during the gifts. ENJOY!!! : Throwing a shower can be stressful, but once everything is set up and the guests arrive, relax and enjoy the celebration! What a great gift you’ve given by throwing her a shower, step back and watch her face as her friends and loved ones talk to her and celebrate this new chapter in her life! She will always remember this time with great joy. Next post: Make Fall Entertaining Easier with Flat-Pack Napkins!